Seniors with arthritis, as well as those who have other health issues that make getting around difficult, including those recovering from a fall, often discover that getting into and out of their sitting chair is one of the most difficult tasks faced. This process is not only simply more difficult for the senior, but can also increase risks for falling and injuring oneself during the process of standing. Using a standing aid is one way that this risk can be mitigated and there are a number of different types of lifting aids that can be used in the home. 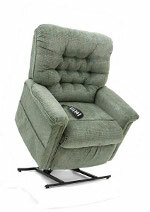 A lift recliner, or lift chair, is a lifting aid used in the home to make it easier for a senior to stand and sit. These devices replace the traditional recliner, offering the same sorts of comfort, such as reclining backrest and a comfortable footrest. However, they are not simply a comfortable sitting chair, but also provide a means for the user to standup or sitdown, on their own. Within the base of the lift recliner itself, a lifting system is placed that is used to raise and lower the chair, user and all. When the lift recliner has been fully raised, the senior can simply back into the seat in a standing position and then transition their weight to rest against the seat as they lower it. When sitting, the powerful lift system can raise the entire chair and user to a position that allows the senior to exit on their feet. Generally, due to their design, lift recliners are used in the living room, as this is the most logical place for a sitting chair, but the only real requirement, aside from being away from water and the elements, is that they are near an electrical plug to ensure the device can be powered on. Bathroom safety should involve a number of steps, like making sure there are sufficient grab-bars throughout the bathroom, non-skid mats on the floor, taller toilets, and reducing the number of sharp edges on counters, since there are so many areas that can increase the risk for a fall. As part of reducing the risk for a fall in the bathroom, many also use a toilet seat lift. Toilet Seat Lifts are designed to make it easier to get onto and off of the toilet. They generally replace the normal toilet seat, with one that is operated by an electrical motor and can help raise the user off of the toilet. Depending on the model, some toilet seat lifts can be installed with little modification to the actual toilet itself. Many also include built in grab-bars, although this should not be a replacement for installing grabbars throughout the bathroom area. Smaller portable toilet seat lifts are also available, which are sometimes used by those who are traveling, staying with a relative, or at a hotel. While getting onto and off of the toilet, as well as getting into a sitting chair, can be very difficult for a senior, often safely entering and exiting the bathtub can be the most difficult task. This is because the senior must basically get onto and off of the floor, navigating a two-foot tall wall in the process. Increasing safety at bath time is very important and often, it is recommended to use a walk-in bathtub, with a shower bench or aftermarket shower chair. Non-slip mats are also important around the bathtub and within the tub itself. However, using a bath-tub lift is also an option. Bathtub lifts come in a few different styles, but generally install within the bathtub itself and provide a way of raising and lowering the senior to the height of the bathtub wall. Typically, they install without modification to the bathtub, using strong suction cups. Most provide a plastic chair, often reclining, which is lifted by a water-proof lift system. However, inflatable bathlifts are also available. The above lifts generally would be used by seniors who are able to stand and get around on their own, albeit with difficulty. While caregivers will often use these sorts of lifts to help make their work easier, the senior should still be able to walk around or at least stand. However, in some cases, it is necessary for a more powerful and comprehensive lifting system. In these cases, Hoyer Lifts, which are very powerful lifts that can raise the patient into and out of bed are implemented. These lifts are often on locking wheels, so they can be moved around the home, as well as allowing for slight pivoting, to make transferring into and out of bed possible. Tracked lift systems, which allow users to move along a track installed in the ceiling are also an option, allowing a user or caregiver to easily move a patient through the different rooms in a home, making things like transferring into the shower much easier.